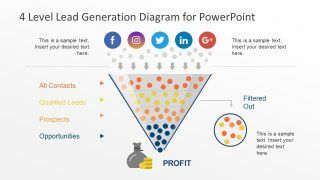 4 Level Lead Generation Diagram for PowerPoint – A digital marketing template for companies operating in various industries. 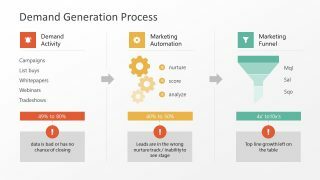 It is an attractive and colorful illustration of the lead generation process. 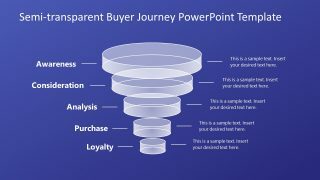 This 4 levels diagram of PowerPoint displays an upside-down pyramid shape portraying a funnel. Each level contains small circular units to demonstrate data elements graphically. While the slides highlight the text description of these levels on right side with an arrow and similar color-fill as data. 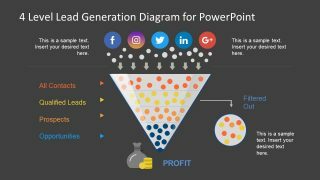 Further, this lead generation template shows social media icons on top of funnel with downwards arrows and gray data elements. These circular icons include Facebook, Twitter, Instagram, LinkedIn, and Google+. Therefore, this 4 level lead generation diagram can present digital marketing process on social media platforms. 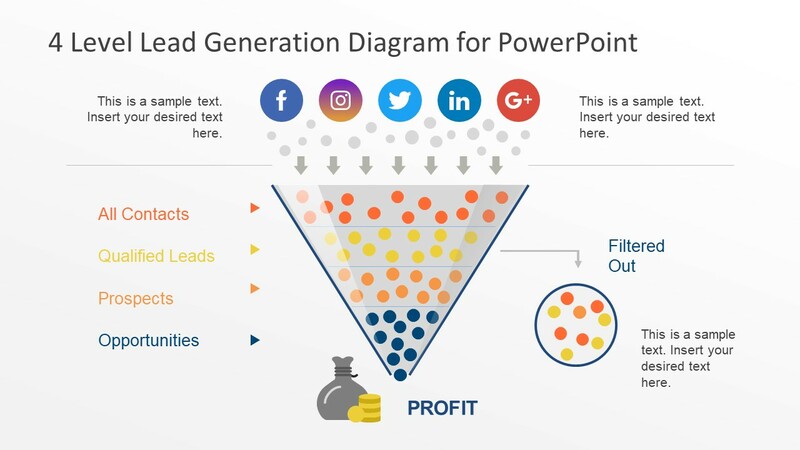 Here, the 4 levels of lead generation include: All contacts – Qualified leads – Prospects – Opportunities and profit is an outcome. The lead generation is a process of promoting and advertising product/service of company to potential clients or customers. The lead generation process involves a strategic approach to convert target customer into prospects. A lead is an individual or company who indicate interest in company’s solution in some way. It could be an online inquiry, a call, or store visit. The most common example of lead generation could be cold calling where representative of company calls with product information. There are no sales involve at this point. The representatives simply take information of potentially interested people and call them. If a person seems interested, it becomes a qualified lead, hence lead generation. The companies like insurance agencies, mortgage, and loan sharks are known businesses who deal with lead generation. 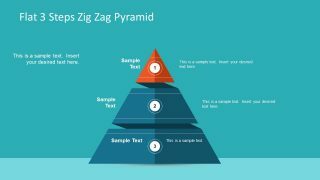 The 4 Leve Lead Generation Diagram for PowerPoint has two slides of white and black backgrounds. 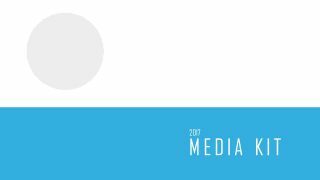 The social media leads are inbound marketing done through advertisement, sponsor posts, and blogs. The template is a collection of editable objects including shapes and icons. The placeholders are available to add the textual content while graphics support the topic visually.